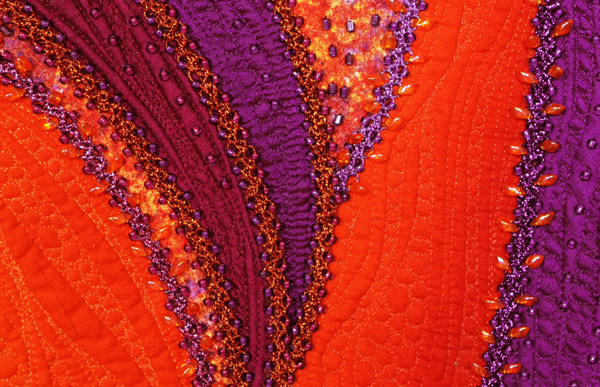 Customers comments , pictures of works done with supplies from this online store and links are posted courtesy of marion jewels in fiber. 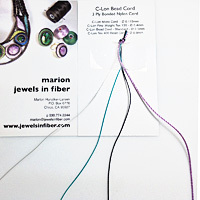 Email comments, pictures or links at marion @ jewelsinfiber.com (remove all spaces) to be included. Comments are chosen at random and arranged by reverse date. 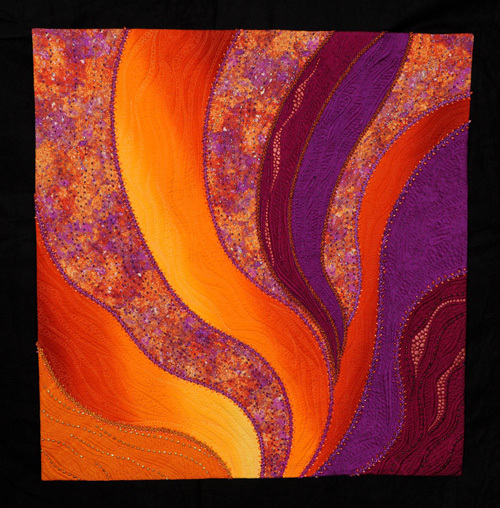 Or visit Marion Jewels in Fiber Page on Facebook... and leave a post! 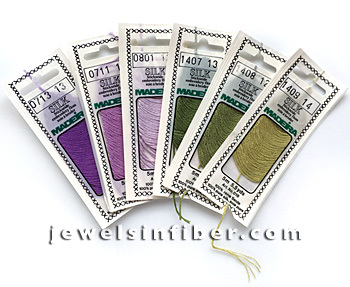 Disclaimers: marion jewels in fiber does not endorse, sponsor or charge for the linked sites listed below nor takes any responsibility for any of the content nor any transactions you may enter in if you follow the links listed below. Most of the praises for packages arriving quickly should be addressed to the Postal Services. We process orders as soon as we can, usually within 24-48 hours at most. Then most packages get into the Postal Service system, a few into the UPS system. Most arrive quickly, efficiently, and at amazingly low prices considering the door to door service... Keep in mind that occasionally a package gets way laid along the way and goes across the country twice before getting re-routed to the proper address, or internationally, it sits at customs... Extremely rarely a package gets lost altogether. October 31, 2018 - Thank you so much! I appreciate your fast, friendly service and especially appreciate you going the extra mile to include that last spool of c-lon thread! Many thanks for your excellence at attention to detail and helpfulness. 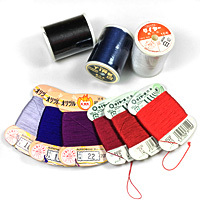 October 19, 2018 - Hi Marion, I have to tell you that your #69 nylon threads are really saving me from having to dye my own white thread to match gemstone beads. What a huge relief! I'm so excited not to have that burden anymore. Thank you, Marion - I have tried C-Lon. Sometimes there is a slight difference in the thickness and softness of nylon #69 that makes it fit through tinier beads better. About mistakes... Occasionally we pick and ship the wrong item... and here is what we do when it happens. 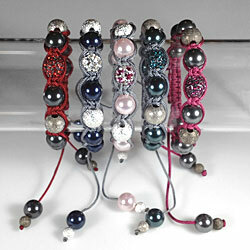 Kalla makes bracelets to support a non-profit she runs, Heart2Heart Pet Lifeline. It helps low income pet owners pay for veterinary bills. 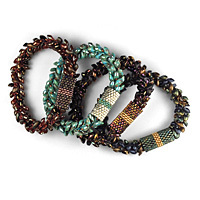 90% of her jewelry sold at small craft fairs goes to H2H. 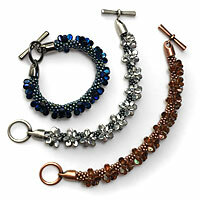 With most orders we include a business card with a sample of all 4 sizes of C-Lon Bead Cord. 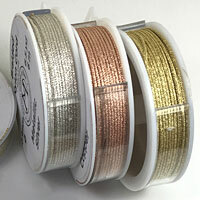 Occasianally we include ribbon or metallic thread samples. All usefull references for current and future projects. 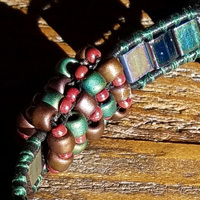 Currently we are including the following samples in most of our orders: C-Lon Bead Cord, all 4 sizes; 3 types of Metallic cords, Shiny, Fine and Iridescent; Panaché Ribbon, 100% Nylon Ribbon, plus a bookmark compliment of the American Kumihimo Society. 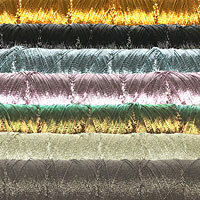 I sent many samples of the metallics to be tested. Here is one of the response... and based on my experience and on Josée, I do not recommend it for micro macrame or any kind of knotting. It is too hard on the cord. December 30, 2016 - Hi Marion, I made a sample with the thread you sent me so here's my feedback (I'll make my best to describe it, I'm French speaking so I might sound weird sometimes). So after testing it, I don't recommand it for macramé. I sent you a picture of my sample. Don't mind the pattern, I didn't have any, I just "free-knotted" the thing. The thread is beautiful, smooth and shiny (the hazelnut is sooo beautiful!) but it's too thin for macramé, plus you can see the middle white thread showing through on every knot (you will see it in the picture attached), and after a while, the thread kind of stretches and the shiny cost gets unrolled and showing more and more of the middle white thread (you'll see it too in the picture, mostly on the upper thread). 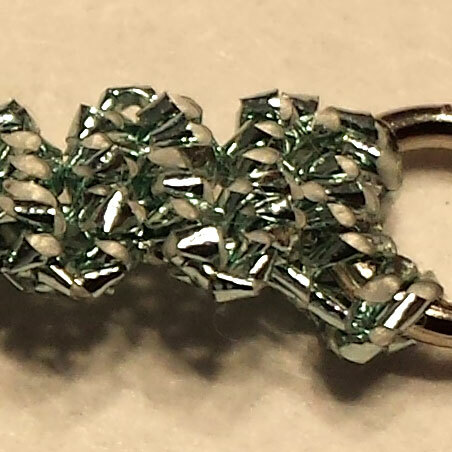 The pattern of the knots isn't clear, kind of blurry because of the shine, the middle thread, and because it doesn't stay smooth after being knotted. Occasionally a package gets delivered to the wrong place or get lost... We re-ship! Oops, we sent GO instead of OG, that dyslexia... but once we were made aware of our mistake we shipped the CLC-OG and Janet got to keep the gold. Occasionally orders get messed up, by us packing the wrong stuff, by the post office or UPS, and sometimes by the buyer not entering their new shipping address or ordering the wrong stuff... When that happens, we do our very best to address the issue in a timely manner. October 3, 2014 - Thank you, this is one of the BEST set of instructions I have encountered. I am enjoying getting back to my beaded crochet pieces. The two attached photos are of a piece I've completed using Turkish flat braid as the finishing design component. For that, I thank you. 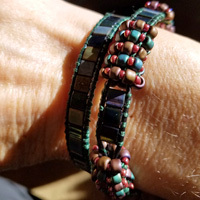 When I have a creative lull in my work, I make bracelets and since I discovered your website, I've used your tutorials. So merrily crocheting away, wondering what what would work to delineate the undulating lines, I had a "duh" moment and "Convergence" then received its final design piece. Please don't ever stop creating...your work is beautiful. April 17, 2014 - Thank you very much for talking to me today about beaded crochet and for the wonderful kit that I bought previously! It was VERY helpful! I’m going to try all the suggestions you made for that invisible join technique and if you do write a tutorial for it please let me know. I don’t want to give up on it! Also, I would appreciate help with making my own beaded crochet designs if you are able to find any info on that. March 10 , 2014 - Thanks Marion for the exceptionally fast service on my recent order. I am amazed that the package arrived here in Missouri today! And also thank you for sending the snips of four blue colors. It really helps to see them in real life. Feedback is great - even when it point to things that could be improved. Nover 28, 2012 - Hi Marion. 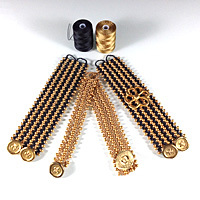 I'm just finishing your "Golden Berries" kumihimo/bead cluster kit. Wow! 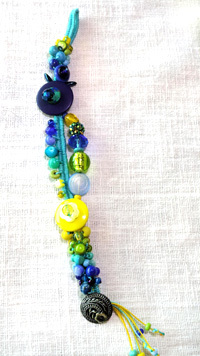 The colors are fantastic and the bead clusters really do look like exotic berries. I love it. I'm going to order another kit but before I do, I was wondering if you sell or can tell me where to buy that beautiful gradated ribbon yarn? The changes of color are fantastic. So much nicer than plain or swirled colors.